Measuring scoop with convenient handle. The essential tool for all your fishing memories. Measuring scoop with convenient handle. Measures fish up to 24". Scoop It! See It! Size It! 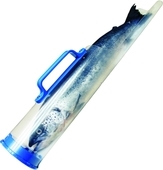 | Description: Measures fish up to 24" | Size: 4" x 25"